Excuse the dire photo, it was night time and, as you can see, well past Archie's bed time! For ease of piecing, none of the 'in block' sashing strips line up with each other and I decided that I wanted to maintain that when joining them up. 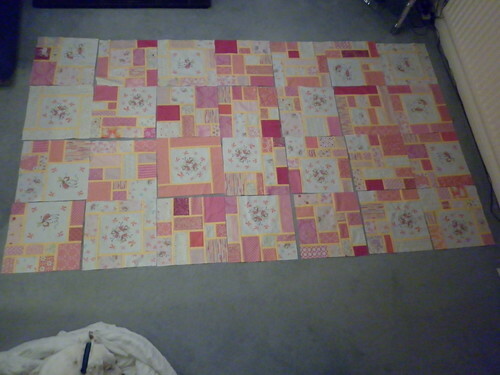 (There will be the same ½" (finished) sashing strips separating the blocks.) I also decided that I didn't want one side of a sashing strip to need to line up with the edge of another strip (i.e. no 'steps' in the sashing) because I would have to ensure they were aligned across the strips, which would take more time; time I don't have! All that, combined with trying to make sure no prominent fabric was next to itself, took some arranging but I got there in the end. 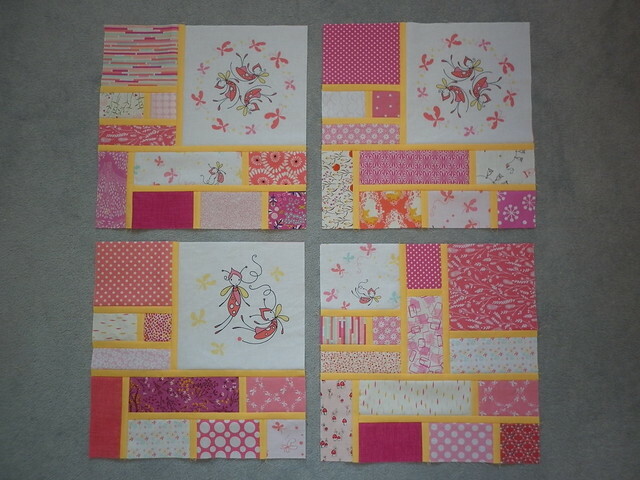 I decided that the prints with the white backgrounds were okay next to each other, it was the more 'obvious' prints (such as the dark pink Sketch or the polka dots) which I didn't want touching. 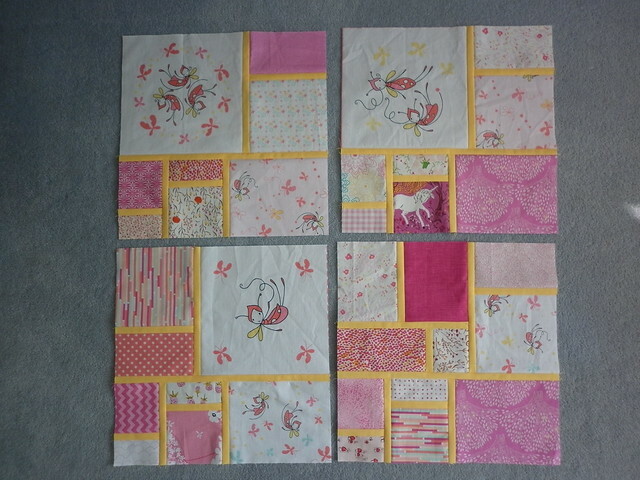 I've since attached all the sashing strips and hope to start joining blocks this weekend. In between finishing the blocks and crawling round on the floor I had a couple of days off from this project (I needed it, I wore myself out piecing!) and decided that hand sewing binding would be a good way of still sewing but at a more restful pace. One of the long term residents of my FAL list is a hand quilted panel, which was my learning-how-to-hand-quilt-with-two-thimbles-a-hoop-and-the-rocking-stitch practice piece (which is how I now do all my hand quilting). I thought I was going to turn it into a cushion but then picked it up, remembered that it is backed with a gorgeously soft fine lawn, and thought it would make a lovely quilt for a teeny tiny baby. I contacted Jude to see if it could be added to Bee Blessed's baby quilt pile and she said yes. I searched my yellow scrap and stash boxes and found a piece of pale lemon fabric which worked well with the pastel variegated thread I'd used for quilting and cut it into 1⅝" strips to make a narrow binding. 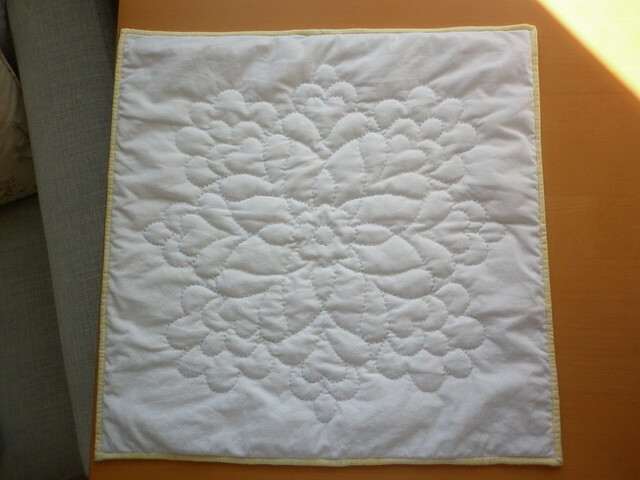 It's around 16" square (I forgot to measure it after I'd washed it!) and the design is by Sandie Lush. It's a little puffy around the edges (it was fine until it was washed!) 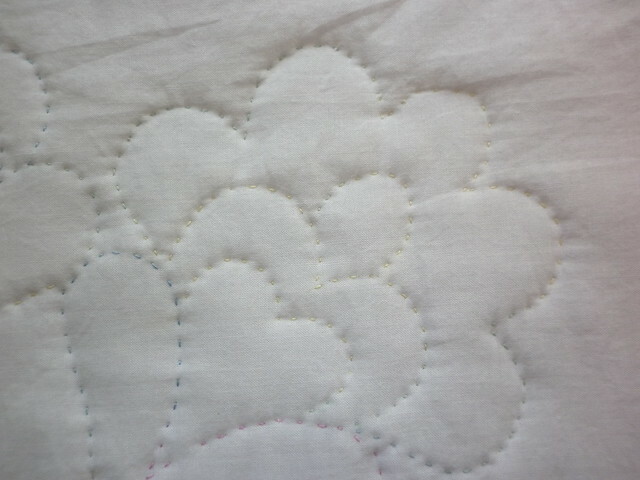 but I didn't want to add any more quilting as it's so soft at the moment. I'm sure baby won't mind a bit of puffiness, at least I hope not! It's now on its way to Jude and will hopefully help to keep a teeny tiny baby warm and comforted in hospital. It's also the first finish from my FAL list so I will be linking up with Adrianne when the time comes! Yes, I can hear you. No, I don't want to come inside. If you think this makes up for the indignity of a bath then you're sadly mistaken. Bowl, why aren't you like the magic porridge pot? It's the first of the month so I'm linking up with the wonderful Lynne, why not go and see what everyone else has been up to? P.S. A couple of months ago I won a Twitter giveaway from Sew Hot and, as I've been enjoying a run of luck lately, I thought it would be nice to share. How does half of this bundle (i.e. ten (I think!) fat eighths) sound? I'll have to look at postage to see if I can include people outside the UK but I hope I can. If that sounds like something you'd be interested in then there'll be a giveaway post at some point in the next few weeks, probably when I've pieced the fairy top! 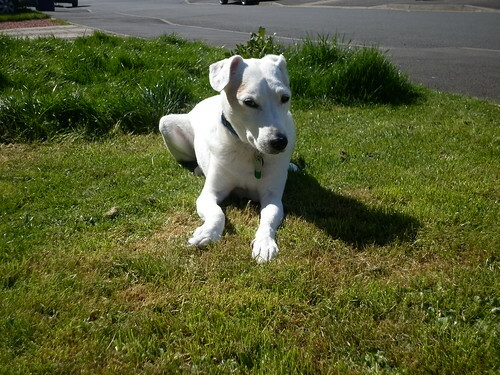 and I had to do a double take on your doggy - he looks remarkably like ours.... Well he looks like a cleaner version of ours as we live on a farm and he loves running about in the mud. 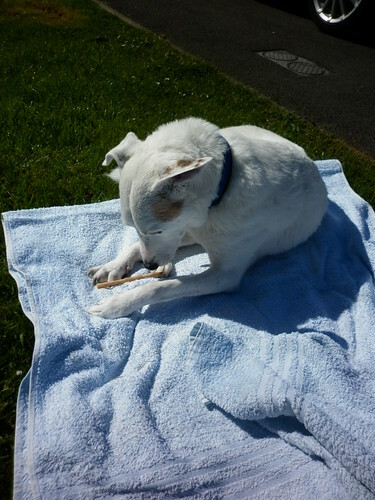 Which isn't ideal for a white dog! Thanks for your lovely comment - I'm afraid I can't reply via email as you're a 'no-reply blogger' so I hope you stumble across this reply at some point! Archie has never really been a mucky dog (apart from fox scent, ugh!) as he's got quite long legs and tiptoes round puddles (really!) which is a good job as he hates being bathed or rubbed down with a towel! Your fairy quilt is beautiful. 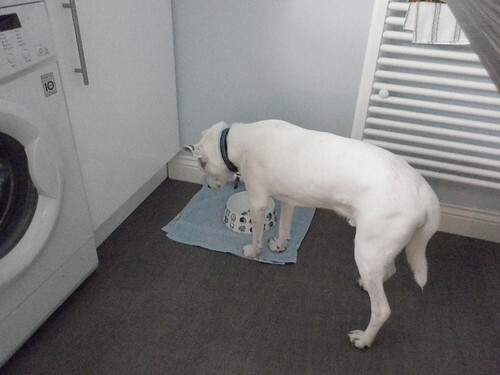 Archie looks wonderful, he seems to be wondering where his lunch has gone. 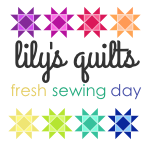 That fairy quilt is going to be a stunner! I love the sashing. oh Helen....I love this quilt! I love these fairy blocks. The yellow strips are perfect for contrast. I'm sure your niece will love it. Well done for sorting the layout. That can be such hard work! They certainly are the "now don't you feel awful for putting me through that bath?" Oh yeah, putting them through.....the totally soaked bathroom, towels, humans, the running through the house rubbing on everything and anything that will get the evil water droplets off them......it's a rough life, sweet Archie. That's what Molly & Jessie say......but, you do look beautiful. What a perfect quilt for a little girl! What little girl doesn't like pink and fairies! Poor Archie, a certain Spotted Dog around here is feeling his pain at the indignities of having a bath. Said Spotted Dog is long overdue for one, question is, are we bipeds up to the task? For some inexplicable reason I am being barred from commenting on flickr so its wonderful to comment here! Love this "Nieces" Quilt. She is one lucky wee gal. 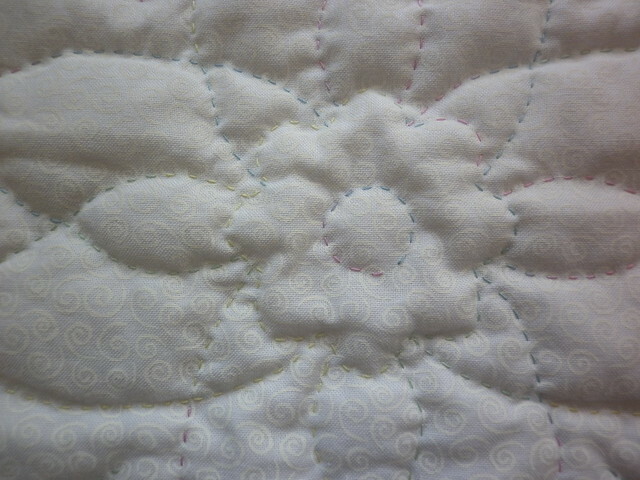 So nice to see your gorgeous quilting in such "up and close" detail . . you are so neat! Hello Archie . . your Mum does take the mickey out of you doesn't she! Of course our POLO has several baths everyday so I dont understand your issue ! The fairy quilt is looking fab, speed dating the blocks can take as long as making them (or feel like it any way) but they look great! The baby quilt will, sure, be loved. 5/8th??? Gosh that is narrow, single? Archie looks nice and clean and beautiful! Great work on the quilt and the tiny quilt! Archie really does have the "I'm a poor sad hungry dog, why is nobody feeding me?" look. I love your hand quilting - it looks soft and lovely. Those fairy blocks are gorgeous! Well done! And I'd totally love to win that fabric. 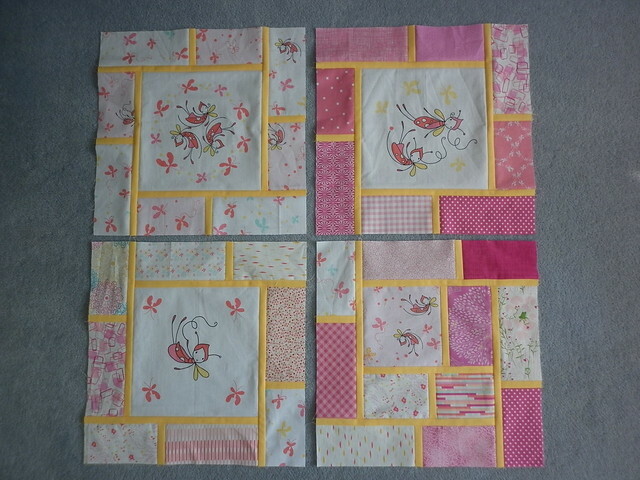 The fairy quilt is going to be great, well done on your progress. 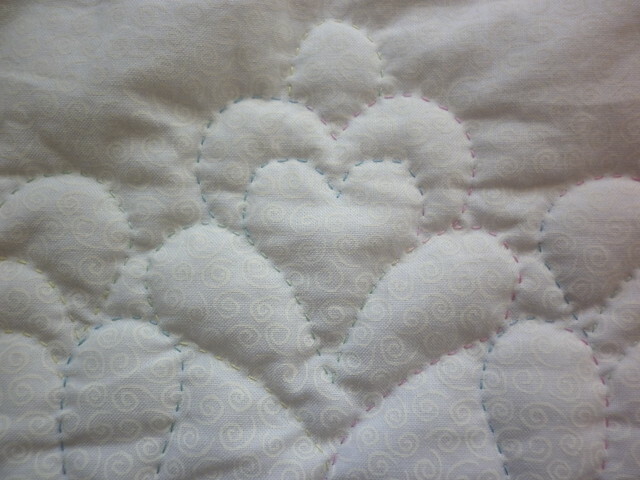 The hand quilting is perfect I'm sure baby will appreciate it one day! They're both great quilts. 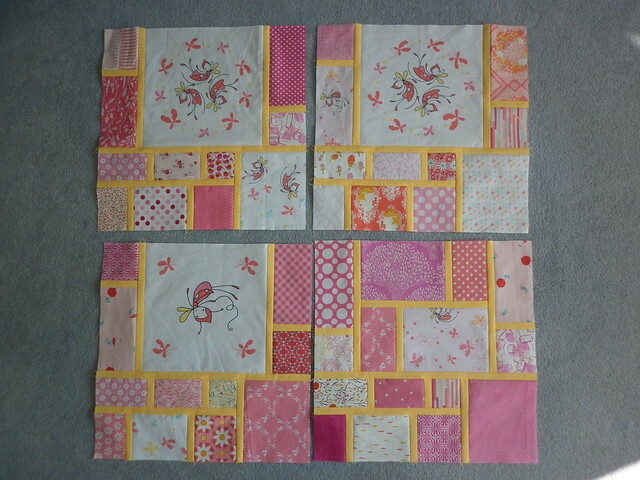 I'm sure any little girl would love the pink quilt. I'm visiting as a member of the official 2015 Finish-Along cheerleading squad. OK . . . Back to where I left off. It has been a gorgeous evening following the Archie trail!